The Adaptation Sub-Committee (ASC) of the Committee on Climate Change reports to Parliament every two years on the Government’s progress in preparing the UK for the impacts of climate change, by delivering the National Adaptation Programme (NAP). The NAP focuses on the whole of the UK for a small number of reserved policy areas (issues on which only the UK Parliament can make laws), and focuses on England for devolved matters, which make up the majority. This is because the Devolved Administrations (Scotland, Wales and Northern Ireland) make policy independently on devolved matters. The ASC was also asked by the Scottish Government to provide an interim assessment of the Scottish Climate Change Adaptation Programme, which was published in 2016. The NAP is a good first step, but the next iteration should be a more strategic, focused document, to make sure the most important priorities are clear and the most urgent issues are being tackled. There should be improved monitoring and evaluation of key policies that aim to address the risks of climate change. Flooding remains one of the most serious current and future risks to the UK from climate change. Investment in flood and coastal defence assets has increased over the NAP period. More needs to be done to address the risks from surface water flooding, as there are no plans in place for the investment that is needed to deal with increasingly heavy rainfall. Impacts on health from higher temperatures are likely to increase in the future due to climate change combined with a growing, ageing population. Action is needed to begin to adapt the UK’s built environment, so that homes and other buildings can be comfortable and safe in higher temperatures. Key indicators of environmental quality continue to move in the wrong direction, putting at risk vital ecosystem goods and services such as clean air, clean water, and carbon storage. Harmful land management practices persist, including on sensitive peat habitats in the uplands. Some of the most productive agricultural land in England is at risk of becoming unprofitable within a generation due to soil erosion and the loss of organic carbon. Without further action, farmers may not benefit from the opportunities of longer growing seasons, and the natural environment will be severely harmed by climate change. There are plans in place and action is being taken to address the risk of future water scarcity. Significant decisions in terms of new water storage, treatment and supply infrastructure will need to be taken. Reforming the water abstraction licencing regime also remains an urgent priority. The ASC’s 2017 report is accompanied by a wealth of background data and indicators published in technical annexes to the main report. The Government responded to the ASC’s 2015 progress report in October 2015 and will respond to the 2017 report in October 2017. The ASC’s 2012 progress report considered preparedness for water scarcity and flooding. The ASC’s 2013 progress report considered the key ecosystem services provided by the land. Specifically, the report addresses the use of land to continue to deliver essential goods and services in the face of a changing climate – supplying food and timber, providing habitat for wildlife, storing carbon in the soil, and coping with sea level rise on the coast. The ASC’s 2014 progress report assessed preparedness related to well-being and the economy, with updated analysis on flooding, and chapters on infrastructure, business, health and emergency planning. To assess the UK’s progress in preparing for climate change, the ASC uses a variety of indicators that measure changes in society’s exposure and vulnerability to climate-related risks, and the uptake of adaptation actions. 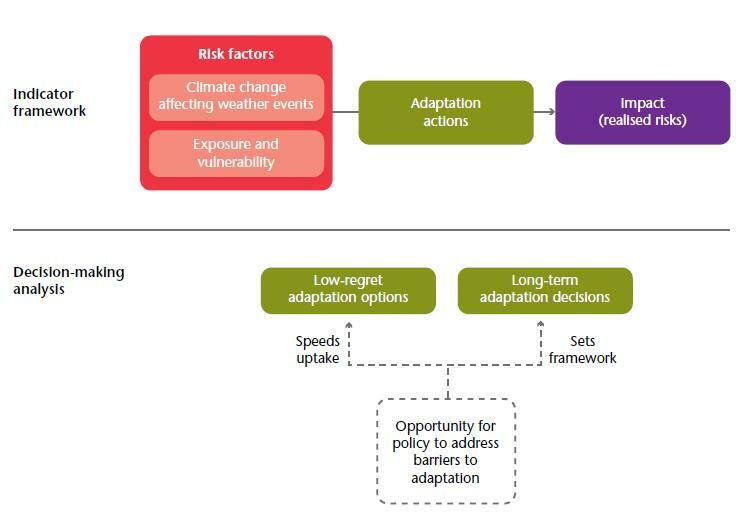 The ASC also analyses decision-making in key organisations to assess if the amount of adaptation occurring is sufficient to address climate risks, now and in the future. More detail on the adaptation assessment toolkit can be found in the ASC’s 2011 Progress Report. Data on indicators and background research are also published alongside each report.